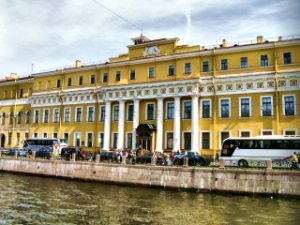 The excursion to Yusupov palace on Moika is also a touch to one of Saint-Petersburg and russian history secrets. Yusupov’s were one of the richest noble families in Imperial Russia, tracking the family origins back to the 6th century A.D. you will know about the history of this famous family, about the Yusupovs curse, that mystically followed them through the centuries. The marvellous interiors of the palace will tell many stories, including the last one, about the deathly opposition of the last Prince felix Yusupov and the last favourite of the last russian Tzar – misterious Grigoriy Rasputin. The conspiracy, leaded by the young Felix, had started in this walls, and the final act of this drama, of a truly historical importance, did also happened here. The small and dark room in the basement of the palace is still keeping the scary secret of the last day of Rasputin.